This Strategic Results Project set out to provide the intervention required to reverse or remediate the consequences of ear disease and hearing loss among a target group of Indigenous students in six schools across the Northern Territory, and improve their literacy. More specifically, it was intended to demonstrate the link between otitis media with effusion (OME, sometimes called'glue ear'), conductive hearing loss (CHL: a preventable type of hearing loss caused by ear disease) and levels of English literacy. Al Yonovitz, now District Manager for Australian Hearing in Darwin, was the project officer and provided the material below. Research has established that Indigenous Australians have a very high prevalence of upper respiratory problems and related diseases, including OME. During the critical years for speech and language development, as well as for growth and elaboration of the nerve pathways between the inner ear and the temporal cortex of the brain, the great majority of Indigenous children are experiencing fluctuating hearing loss. Such sensory deprivation during the developmental period subsequently makes it much more difficult for these children to learn English as a school language. OME in advantaged populations around the world is approximately 5% in childhood, falling to less than 1 percent after age 12. The prevalence of OME among Indigenous Australian children living in remote communities has been found to range from 40%-70%, with younger children experiencing more frequent infectious episodes. Eardrum perforations and ruptures typically begin within the first three months of life. With repeated ruptures, healing, and reruptures, the eardrums become scarred and thickened. In many cases, the ruptures become too large to heal and require reconstructive surgery to repair. In rare cases, reconstructive surgery is not possible, but bone-conduction hearing aids can be provided with excellent speech perception results. The middle ear disease that causes CHL is medically treatable, and in appropriately managed cases there should be no persisting hearing loss. Otitis media is a chronic disease and is at epidemic proportions, among the highest in the world, in the Northern Territory. We have a serious health problem, even as defined by the World Health Organisation in the context of third world nations. It has extreme consequences as a barrier to literacy, but it also has consequences for the potential of the realisation of a person's personality, social interaction and their economic potential with regard to employment. To have fluctuating hearing loss at an early age, especially when a child is learning English as a second language, affects the whole personality of an individual. Otitis media and the problem that it raises for Territorians is that it is not just a medical problem. It's a disease of overcrowding, it's a disease of poverty — but the educational ramifications are immense. And the solutions aren't just found in the medical intervention, but can be found in the kinds of hearing interventions that good educational practice can achieve. That was our principal reason for wanting to be part of the SRP projects. It was really an attempt to be able to show teachers and those who work directly with children in education settings, that the reason that they are so frustrated with their teaching experience sometimes, and the reason that children aren't learning, is because children are suffering from the long term consequences of early and continuing fluctuating hearing loss. Ear examination and hearing testing was provided for 1032 students. Those students found to have active ear disease were provided with medical treatment, in cooperation with families, schools and community clinics. In summary, 79% of this group of Indigenous students were found to have an educationally significant hearing disability. Findings in more detail were as follows. Forty per cent would conventionally require physician services to treat active middle ear disease and/or provide reconstructive ear surgery - 16 percent had persistent and significant conductive hearing loss in both ears; 24 percent had conductive hearing impairment that would cause major difficulties for students learning English as a foreign language. In addition to those above, 38% had indication of a Central Auditory Processing Disorder (CAP-D) displayed by poor speech discrimination scores and intolerance of background noise. structuring learning environments to promote inclusion of students with hearing disabilities. The inservice program concluded with a negotiated plan for how each school would be involved. FM sound field amplification systems were provided to all schools where appropriate, except one which already had the equipment and one which had design issues likely to make the equipment of doubtful benefit. 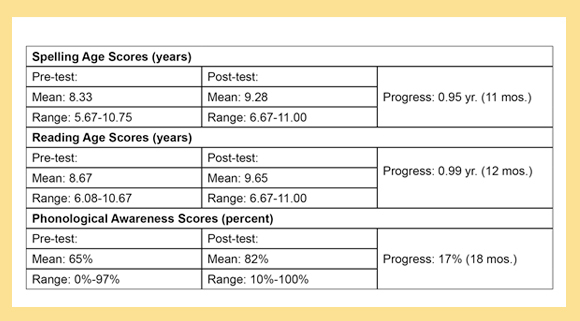 Students' literacy and phonological awareness levels were tested at the beginning (pre-test) and end (post-test) of the project to measure the impact of the school-based intervention program. Assessments were separated by approximately eight months. The scores reported below are those of students who attended at least 75% of school days in 1998 and were available for both pre- and post-testing. Across all six schools, 21 percent of students (n= 212) met these criteria, but none of the students in the Primary (5-11 year-olds) category did. Thus, this became an analysis of the literacy progress of secondary-aged students. Ear disease and hearing loss are much more prevalent in younger children and can be associated with their generally poor health and poor school attendance. Data also exist for the six schools separately. These indicate that the cohort of students in the school with predominantly older Indigenous students (who are therefore more likely to have stayed in school longer) is more likely to achieve above Intensive English Level. This is evidence that students' persistence in returning to school from year to year, in addition to their daily attendance during each year, is related to their ear health, hearing status, achievement level and literacy progress. Al Yonovitz discusses the findings. Indigenous Australian students in this project had a very high prevalence of ear disease and persisting hearing disabilities compared to non-Indigenous students. Very fundamental, but one has to accept this to move forward and the data clearly supports this. The relationship between hearing loss and decreased school achievement for Indigenous students was again strongly established. Hearing support services at school are especially relevant for Indigenous students learning English as a second language — this can't be underestimated! English is the school language, and students who have to work at the stressful activity of trying to understand what is said on the basis of second language or foreign language issues, and then have a hearing loss on top of that, encounter a nearly impossible task. Hearing support services are very important to bridge that difficulty. Phonological awareness scores predict literacy level. 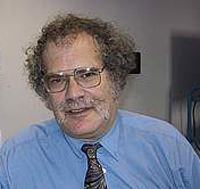 The importance behind this is that when one gets down to the pedagogical issues in teaching literacy and teach literacy to children with even modest hearing impairment, the desire is very strong to make an auditory approach seem very helpful to the phonological process and that's what phonological awareness specialisation would readily allow in this case. It's really an opportunity to make the auditory system exercise, and this becomes very important when children have a hearing impairment and don't have the usual experiences in early childhood of phonological processing. Something again that is entirely reversible — classroom acoustics. They vary throughout the Territory schools considerably, but they are generally very poor listening environments for students with hearing disability, especially when they are learning English as a foreign or second language. Classroom acoustics standards are in development and there are methods that should be incorporated to reduce the very high reverberation and the very high background noise that makes listening extremely difficult for students. Classroom sound field systems shouldn't be used to just compensate for poor classroom acoustics. The combination of the management of classroom acoustics and the sound field system will go far in improving these situations. Many students have reduced capacity to process auditory information. Central auditory processing disorders may be part of the sequel to the early onset of conductive hearing loss. So not only are we saying that learning English as a second language is difficult and learning English as a second language becomes even more difficult when a child has a hearing impairment — but now we have to rely on the hundreds of investigations that have supported the notion that if there is an interruption in normal audition during early childhood years, and you may certainly expect to see processing disorders occurring. Finally, the one statement that reflects the data clearly from over a thousand students in the Territory is that high-attending Indigenous students who have ear disease and hearing loss, where there has been intervention — they stay in school longer and achieve above intensive English.